Cortina d’Ampezzo is located in the province of Belluno and is connected to all the major cities of northern Italy. One can get to Cortina by car via the A27 (Venezia – Belluno), or via the A22 (Modena – Verona – Brixen – Innsbruck). Many specialized companies in Cortina provide transfer service to and from the airports and train stations. 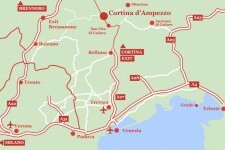 Cortina Express buses run between Cortina d’Ampezzo and the neighboring cities, due to the available bus routes to and from Treviso, Venice, Rovigo, Ferrara, Bologna and Milan. Cortina d’Ampezzo is easily connected to the Calalzo di Cadore and Dobbiaco train stations, due to the bus route services that coincide with the arrival and departure times of trains. The Cortina-Calalzo route is served by the DolomitiBus company. The Cortina-Venice and Cortina-Bologna routes are served by the Cortina Express company. The Cortina-San Candido route is served by both the Sad and Cortina Express companies. The nearest airports to Cortina d’Ampezzo are the Venice Marco Polo, Treviso Canova, and Bologna airports. 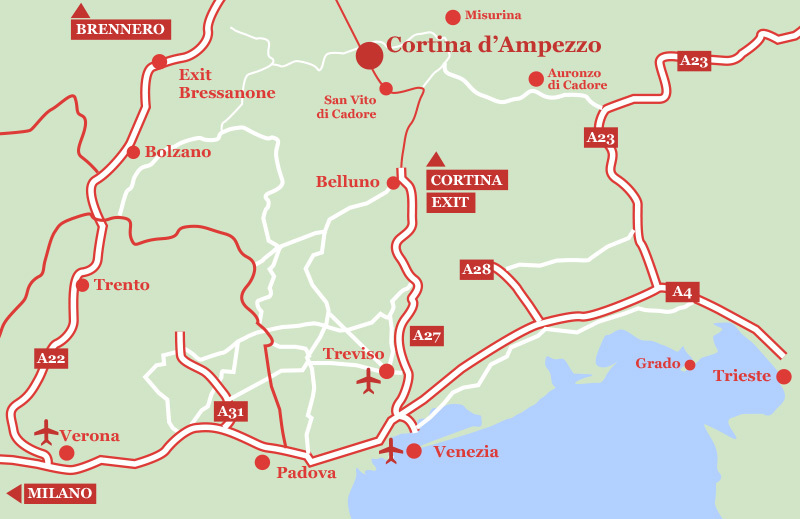 The Cortina Express bus routes connect Cortina with the Venice, Treviso and Bologna airports.